I’ve solved this problem by separating the map from the listing of stores. As you’ll see if you click the link and check it out, I’ve broken the map into small sections, each assigned a number. Then separately, I list all the stores in each numbered section, in sequence. Since I am in the shuk on a very frequent basis, I tend to notice every little change. Whenever I do, I will update the listing, while leaving the map the same. You’ll notice that parts of it are drawn in blue, and parts in red. 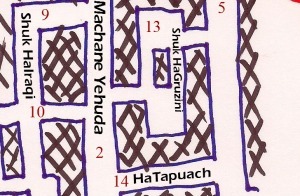 The blue marks the actual Machane Yehuda Market. For more on this, you can check out my prior post about the construction of the shuk. So for the actual market itself, I have listed every single basta (the word used for a stand or store in the shuk). For the red sections, I have listed some highlights. Secondly, the core of the shuk remains food stands — produce, meats, fish, spices, etc. I do no list every single such store by name, because frankly the names are worthless in most cases. If you asked someone the name of any stand they regularly visit, most would have no idea (if it even has a name). I just list them by what they sell. In my next post, however, I will do my best to highlight a few of the stands that I prefer to shop at, and will explain why. I’ll also discuss some of the more surprising finds in the market. You will also see that the stores are in two lists below the map. First, I break most of the stores down by category (not counting the generic produce, butcher, fish, etc. categories, since those should be really easy to find). This way, for example, if you wanted to find the drug store in the shuk, or Uzi Eli “the Etrog Man,” you can look them up and see where they are located on the map. But beneath that I list the stores in each section. This is where you can find the comprehensive listing. The observant will also notice that there are some stores listed more than once. When a store is located at a corner, I may list it in both sections. Also, for the longer streets that I broke into multiple sections, I repeat the ending point of one section as the starting point of the next. I encourage you to print out the map and the list, and bring it with you on your next visit to the shuk. I will endeavor in the near future to make a “printer friendly” version of the store listings so that they can easily fit on one or two pages. But for now, this should suffice! 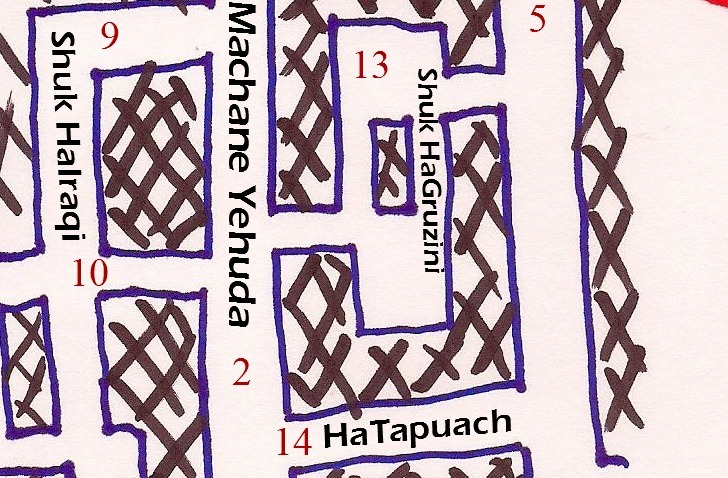 Keep your eyes open for my next post in the “All You Want to Know About Machane Yehuda” series, in which I will use this map to highlight all of the wonderful things you can find in the market! If you have any questions about Machane Yehuda, or would like to book a tour in the shuk, please get in touch with me. And of course, please feel free to leave comments on this post below, and/or share it with your friends who may be interested! this is amazing!! todah rabbah! You missed the Freezee machine in Pizza Machane Yehuda (area 8). I think it is important enough to get its own listing! Fun map all the same. Nice idea. One suggestion. You need to make the map so when people put the mouse over an area that a small window pops up with the stores in that area. It is not difficult to do. Not a bad idea at all. A bit beyond my personal level of tech expertise (though I know it isn’t THAT complicated), but perhaps in a future iteration, I can try to include it as well. Thanks for the suggestion, and hope you’ll keep coming back to see updates!